Does your next promotion call for a gift that is both eco-friendly and practical? If so you need to check out this cheese board. 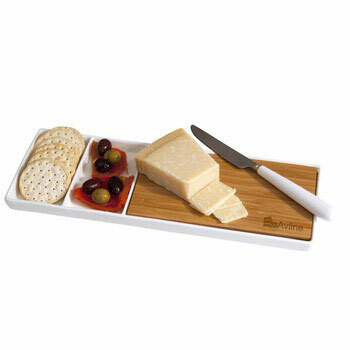 Made from quality ceramic and featuring an eco-friendly renewable bamboo board, Party Plate is a must have. Use around the office, at home or when you’re out and about, this cheese board even has two snack compartments ideal for olives, crackers or for your favourite accompaniment. A cheese knife is also supplied ensuring Party Plate is ready for use as soon as it’s received. To ensure the ecofriendly credentials of this promotional gift, your logo is laser engraved into the bamboo to create a 3 dimensional effect. Laser engraving is not only eco friendly but also an upmarket option when branding a gift of this quality. This best seller is ideal as a give-away when first impressions are important. The subtle nature of the branding ensures that this promotional product will be used by the recipient over and over. Party Plate is ideal as a promotional giveaway at Christmas time, holiday time or anytime a quality leisure related gift is needed.